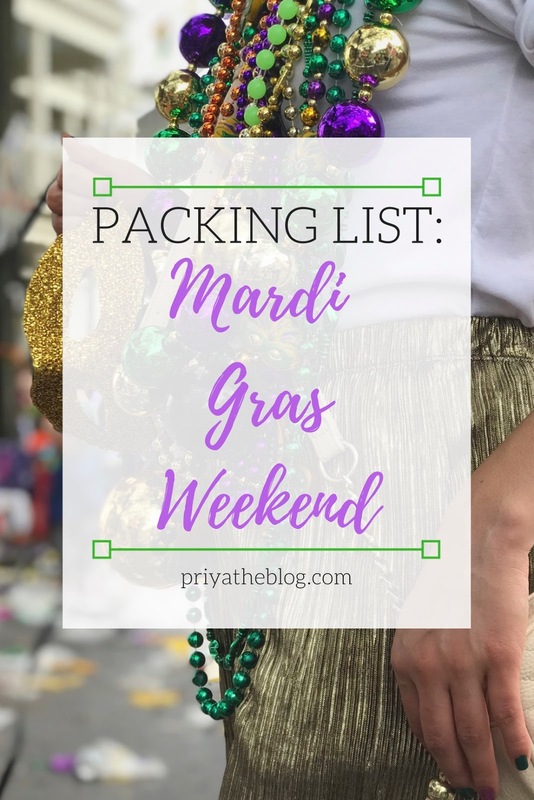 Packing List: Mardi Gras | Priya the Blog | life & style in Nashville & beyond! As soon as I confirmed my trip to New Orleans for Mardi Gras (about a month ago, whoops) I hopped online to search for a packing guide. SURELY a blogger had gone before me to do the work and help a sister out, right? WRONG! I couldn’t find anything (note- if you know of one, please share!) 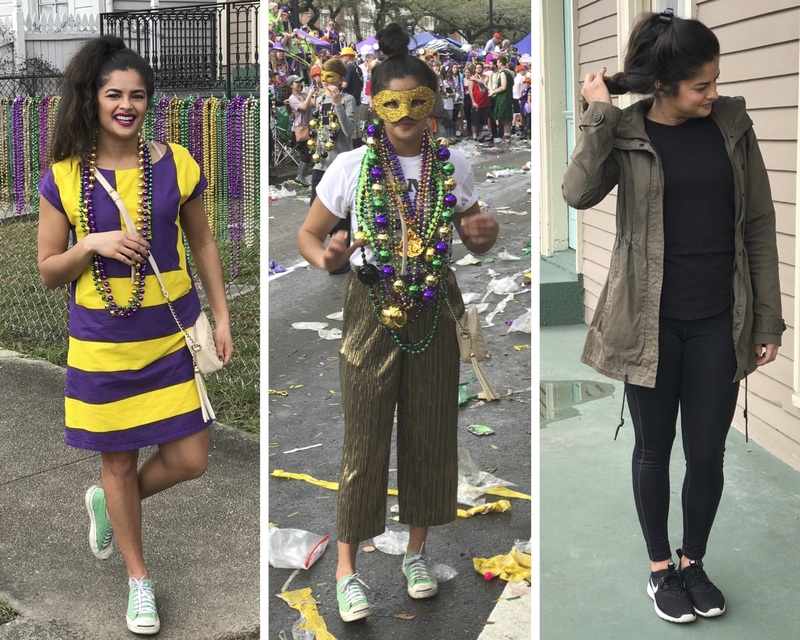 As this was my first time going to Mardi Gras, and one of my personal mottos is Never a Girl Scout but always prepared, I took it upon myself to create the perfect Packing List for a Mardi Gras weekend. I hope this is helpful to those of you planning for your first Mardi Gras experience, or even your 10th (but most stylish, for sure ;) ! + Notable activities | MARDI GRAS! Parades, lots of walking, a house party, brunch, lunch, and dinner out. + Three t-shirts & a sweatshirt | Cropped hoodie for a cool travel outfit & nothing else, my beloved giant tie-dye Lagunitas t-shirt for sleep/lounging, a statement for a parade day, & a black tee for the way home. + Three pairs of pants | My gold Topshop pants are, in my mind, the pièce de résistance of this entire packing list. They were PERFECT. My donut leggings were just for sleeping and hanging out after too many beignets, don’t worry. I wore my black Girlfriend Collective leggings for travel both ways! + Two dresses, one jumpsuit | I was SO excited to pack this striped Marimekko dress that I’m convinced was designed for Mardi Gras. The velvet dress was a back-up, in case I wasn’t feeling one of my other parade outfits. I threw the jumpsuit in last minute but didn’t need it. + Two pairs of shoes, cross-body purse, sunglasses | Really the only thing to note here is to pack comfy shoes that you can THROW AWAY without any regrets, because they will get disgusting (Mardi Gras Grime included in this photo so you can see what I mean.) Oh, and a cross-body purse because you’ll need to be hands free to catch all the float goodies! + Two jackets | (forgot to get pics...) my green utility jacket & a tan rain coat, both of which I barely wore. + Also not pictured | toiletries, make-up, undergarments. And the best part of going to Mardi Gras is that you do NOT need to pack any accessories - you will catch more than enough, trust me. + Outfit #1 | This was from our big Mardi Gras Saturday that started with a parade at 11am, & ended at about the same time that night; with a couple more parades, brunch, a house party, the French Quarter, Café du Monde, & jambalaya in between. I was so excited to wear this dress (I got several compliments on it too!) and stayed super comfortable all day. I think I even remarked that I’m so used to wearing uncomfortable shoes that walking all day in my Jack Purcells was a dream. I’ve mentioned before that I’m a huge fan of dresses for travel – one piece and bam you’re dressed! Also can you TELL how muggy it was – that ponytail, girrrrl. + Outfit #2 | I wore this on day two, that started out a bit slower…but still with a local parade, more hanging out and walking around, and an eventual pig roast. I’d only ever worn these gold pants (one of my favorite items in my closet, here’s the story of how I got them) dressed up with a crop top and heels for a night out, so it was fun to dress them down. Pairing them with trainers and a t-shirt felt very on trend, and I loved being able to make v relevant political statement with my t-shirt (designed by my talented friend Jake at WHAT. Creative Group.) I caught this mask off a float, isn’t it great? + Outfit #3 | This was my work from home/drive home outfit. I rarely travel without black leggings of some kind, they are so multipurpose; comfy for long trips, sleeping, and even a casual outfit in a pinch. I also rarely travel without these Nikes, they are light, packable, machine washable, comfy, and cool. I mentioned it got super cold this day, but otherwise this outfit did the job. + Did I like what I wore? | Maybe more than any other trip- i LOVED it. Theme-y outfits are so my jam! + Did I feel comfy/prepared? | Yes! I was mostly sweaty, except for the last day when the temp dropped. + Did "stuff ruin my trip"? | Nope. 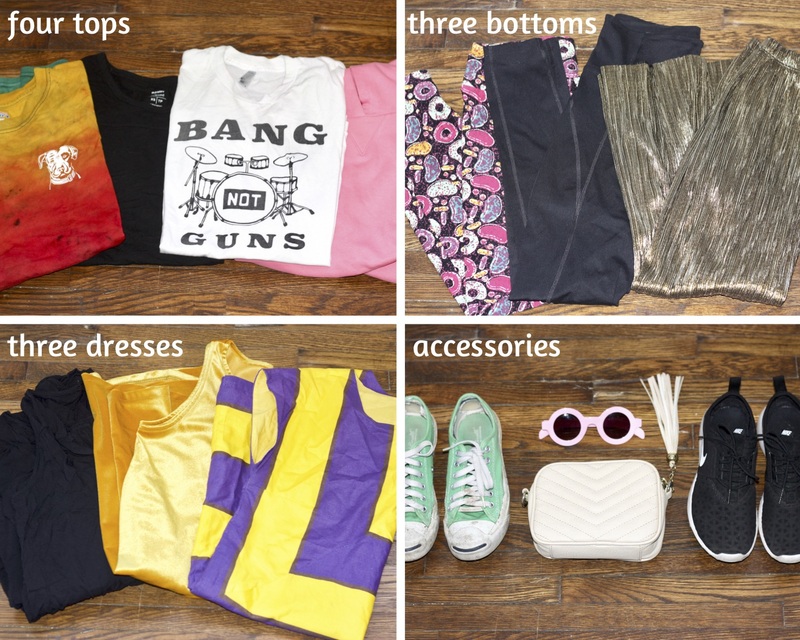 This was a lean, mean, packing list, with only outfits I loved wearing! I hope you found this Mardi Gras packing list interesting and maybe a little helpful! If you’re a ragin’ Cajun expert, let me know what I should have packed. I would love to hear about your Mardi Gras experience if you have one! Oh, and I love reading packing lists, so feel free to share any with me below!